Sola Bingo is taking social bingo to a brand-new level. The online bingo site is offering all players the chance to play chat games, break-time quizzers, and much more. All you must do is sign up and play with them this month. Sola Bingo’s chat games can see players win a total of 200% of their last deposit during the past 10 days. The prize will be paid out in the form of free tickets. Newbies can player these games for free for the first seven days after signing up, and after that players are required to purchase at least 2 tickets per game if they wish to compete in these bingo rounds. Break Time Quizzer games take place throughout the day, and players are required to answer a set of questions by Sola Bingo’s friendly chat hosts. They can win up to 100 free bingo tickets if they answer correctly. These competitions make the important break between games so much more entertaining. Facebook offers and Twitter deals are also part and parcel of the promotion set up at Sola Bingo. Players can snap up 50 free bingo tickets simply by liking Sola Bingo’s Facebook page, and if they decide to follow the online bingo site in Twitter, and you can take away another 50 free bingo tickets. Bingo and social media is seemingly strewn together with style at Sola Bingo, and you can snap it all up today by choosing to play there. 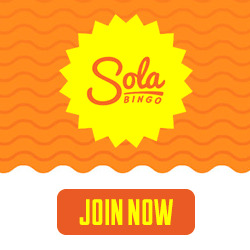 Join Sola Bingo as a newbie today, and you can claim a free no deposit bonus which is worth a tenner. You can also deposit and spend £10 to start playing with 360 in your account, but only when you join Sola Bingo this month.